The Romulans (/ˈrɒmjʊlənz, -jə-/) are an extraterrestrial humanoid species in the science fiction franchise Star Trek. First appearing in the original Star Trek series in the 1966 episode "Balance of Terror", they have since made appearances in all the later Star Trek series: The Animated Series, The Next Generation, Deep Space Nine, Voyager and Enterprise. In addition, they have appeared in various spin-off media, and prominently in the two feature films Star Trek: Nemesis (2002) and Star Trek (2009). Throughout the series, they are generally depicted as antagonists, and are usually at war with or in a tenuous truce with the United Federation of Planets. On extremely rare occasions, they have allied with the Federation. They generally do not get along with Klingons either, whom they consider to be a savage race, while the Klingons consider Romulans dishonorable. The Romulans also act as a counterpoint to the logical Vulcan race, whom they resemble and with whom they share a common ancestry. As such, the Romulans are characterized as passionate, cunning and opportunistic — in every way the opposite of the logical and "cold" Vulcans. The Romulans are the dominant race of the Romulan Star Empire. Although Star Trek star charts place the Romulan Empire's territory in the Beta Quadrant of the galaxy, in Star Trek: Deep Space Nine they are referred to as an Alpha Quadrant power. The Romulans were created by Paul Schneider, who said "it was a matter of developing a good Romanesque set of admirable antagonists ... an extension of the Roman civilization to the point of space travel". There are some differences in their history and the way they are portrayed on television, in the motion pictures and in non-canonical media. The Romulans began as a group of Vulcan revolutionaries who refused to accept the Vulcan philosopher Surak's teachings of the complete suppression of emotions. At some point in their shared history, this group left the planet Vulcan, eventually settling on the planets Romulus and Remus. In the original series episode "Balance of Terror", Spock notes that while the events during the period of Surak are well documented (as per episodes that detail such like "The Savage Curtain"), he is uncertain about their connections to the Romulans. He does state that he thinks them a likely offshoot of Vulcan. The Next Generation episode "The Chase" implies that Romulans, Vulcans, Cardassians, Klingons and humans share a common ancestry. Like Vulcans, Romulans have pointed ears, upswept eyebrows, and copper-based blood (Hemocyanin) that is green when oxygenated in the arteries and copper or rust-colored when deoxygenated in the veins. In the original series, Romulans were essentially indistinguishable from Vulcans in appearance, but subsequent series and films introduced a V-shaped ridge above the bridge of their nose, a similar prosthetic make-up development to that of the Klingons. Like Vulcans, Romulans are almost always depicted as having dark or black hair. Romulans share the longevity common to their Vulcan cousins. In "Unification", the Romulan Senator Pardek shared a friendship with Ambassador Spock lasting at least 80 years. However, the similarities end when it comes to Vulcans' mental or physical abilities, which the Romulans do not share, or perhaps lost after their arrival on Romulus. Vulcans developed naturally greater physical strength than humans due to the higher gravity of their home planet, whereas Romulus' gravity is analogous to that of Earth. Romulan ale is a fictional popular blue alcoholic beverage which was illegal because of a Federation trade embargo in the late 23rd century (per Star Trek II: The Wrath of Khan and Star Trek VI: The Undiscovered Country) through the late 24th century (per Star Trek: Nemesis). Despite this, it is often traded and consumed openly. During the alliance with the Federation during the Dominion War, Romulan ale was briefly legalized, even though it was later outlawed again after the war, as stated by Geordi La Forge in Star Trek: Nemesis. Other Romulan drinks include Kali-fal, a blue drink with an aroma that should "forcibly open one's frontal sinuses before the first sip." 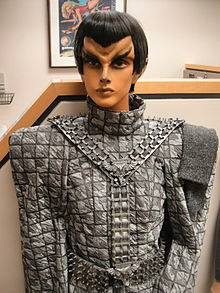 Romulan fashion of the late 24th century had distinctive squared shoulders. Hair is generally cut straight across the brow close to the eyebrows, with longer locks framing the face, cut following the cheekbones, a style reminiscent of a helmet. In Star Trek: The Original Series, Romulan military uniforms consisted of a gray tunic with varying kinds of decorative sashes. Commanders wore red sashes, senior officers wore blue sashes, and most soldiers wore no sash at all. In subsequent series, such as Star Trek: The Next Generation, Romulan uniforms were of a different style, with varying kinds of patterns and colors. The dominant uniform style thereafter was gray under a pattern of squares. The rank insignia on the Next Generation-era Romulan uniform consisted of a series of diamond and crescent shapes, worn on the left collar. Their uniforms tend to fit rather loosely, and often feature large phaser holsters that allow the entire weapon to be 'dropped in', hiding most of it from view. As of Star Trek: Nemesis, Romulan uniforms were more standardized. Episodes of the fourth season of Star Trek: Enterprise depicted the 22nd century Romulans wearing exactly the same uniforms as those of the 24th century Nemesis. Romulan military uniforms follow a distinct pattern through the 23rd and 24th centuries. Male hairstyles do not appear to change greatly, although 24th century hairstyles seem more distinct from Vulcan hairstyles. Females in the 23rd century wore long hair in a variety of styles. By the 24th century, females wear a style similar to males. The emblem of the Romulan Star Empire depicts a large bird of prey clutching the worlds of Romulus and Remus. The avian motif also appears on their warbird starships. Those who rejected the teachings of Surak were said to be "beneath the raptor's wing". Designer Herman F. Zimmerman has said regarding interior design, "the Romulans have possessed advanced technology a lot longer than the Federation, so the look was a combination of art deco and medievalism meets high tech. Most of the designs were inspired by Italian designer Carlo Scarpa." Regarding exterior design of the Senate area, designer Syd Dutton said director "Stuart Baird wanted us to think about Albert Speer, the architect who did all the conceptual drawings for Hitler. Speer took that National Socialist idea to an extreme where everything was huge and classical and they have moats. "The Romulans are a people who live in a marshy area. They had little houses on stilts around mudwork. The mudwork became part of this central core and that was where the old part of the city-–the Forum and Senate buildings-–was located. As the city expanded going away from that, the buildings became bigger and more technological." The Imperial Senate is the main governing and legislative body that meets in a large chamber in the capital city on Romulus. The Senate is headed by the Praetor, followed by the Proconsul. The Continuing Committee is composed of nine members. Only the Praetor, who heads the Committee, is guaranteed a seat; others, even the chairman of the Tal Shiar, must compete to be allowed in. Some of the Committee's duties include the confirmation of a new Praetor, and to hear criminal charges brought against Romulan Senators (in the Star Trek: Deep Space Nine episode "Inter Arma Enim Silent Leges", the Continuing Committee convened to hear evidence of treason for Senator Kimara Cretak). It has been implied that Romulans use a caste system and an autocratic government. The Romulan contempt for Vulcans, their treatment of other sentient species, such as the Remans, and their need for strict conformity, suggests that Romulan society consider themselves superior to the other races in the Star Trek Universe. The Romulan Star Empire once had an empress. A member of the Q Continuum informed Kathryn Janeway that he had considered having a child with the Romulan Empress ("The Q and the Grey"). However, it is unclear when the Romulans possessed this system of government, or how it functioned in relation to the Romulan Senate, or even if they have abandoned the monarchy. The Romulan term for their mythological place of creation is "Vorta Vor". In Romulan society, females are equal to males, both having equal ability to rise through the ranks of the military. In fact, there are more notable female characters than male, notable females include Sela (Tasha Yar's daughter), Caithlin Dar (Star Trek V: The Final Frontier), Donatra (Star Trek: Nemesis), Taris and Toreth (TNG: "Contagion" and "Face of the Enemy", both played by Carolyn Seymour) and the Romulan Commander in the TOS episode "The Enterprise Incident", who is never referred to by name. In Star Trek canon, the Romulan military appears to be a "combined" service, like Starfleet. Its version of "joint chiefs of staffs" is the "High Command" (TNG's "The Defector"), an institution most likely carried over from and modeled on the Vulcan High Command (Star Trek: Enterprise). Some Romulan military ranks are recognizable army and navy versions, while others are either carried over from the Vulcan High Command or entirely new. Perhaps army-specific ranks are reserved for the Tal Shiar. One lowly rank in the Romulan Guard is "uhlan" (TNG's "Unification, Part II"). This actually derives from an in-joke in an early fanzine, Tricorder Readings circa 1970. A fan wrote in explaining who the original Uhlans were, and wisecracked that because regiments of uhlans existed in the armies of many countries, Roman uhlans could be "Rom Uhlans". The joke was probably reprinted in several other fanzines. The real meaning of uhlan is "lancer". The lowest commissioned military rank appears to be "sublieutenant". In TNG's "The Defector", Admiral Alidar Jarok initially used the cover name "Sublieutenant Setal", a mere "logistics clerk". "Sublieutenant" presupposes the next-higher rank of "lieutenant", but this is speculation because no Romulan character has had that rank. "Centurion" is the next-highest rank and probably the most common. In TNG's "The Enemy", Centurion Bochra appears to be an ordinary, midlevel officer. However, the nameless Centurion in TOS's "Balance of Terror" seems to be a senior officer who holds sway with his commander, having served on more than 100 campaigns with him. "Subcommander" may be a holdover rank from the Vulcan High Command (T'Pol initially holds it in Star Trek: Enterprise). It's usually reserved for executive officers on Romulan ships (Tal in TOS's "The Enterprise Incident" and N'Vek in TNG's "Face of the Enemy"), but in rare cases, subcommanders may captain their own Warbirds (Taris in TNG's "Contagion"). In addition, some subcommanders have served in exchange-officer roles (T'Rul in DS9's "The Search, Parts I & II") or as government attaches (Velal in DS9's "Inter Arma Enim Silent Leges"). "Commander" is the rank usually reserved for individual Warbird COs (Toreth in TNG's "Face of the Enemy", Sirol in "The Pegasus", and Tomalak in "The Enemy" and "The Defector"). However, some commanders have had charge over fleets of Warbirds (the unnamed Commander in TOS's "The Enterprise Incident" and Sela in TNG's "Redemption, Part II"). "Admiral" is the highest naval-style rank and is accorded to sector commanders (Jarok in TNG's "The Defector") or fleet commanders (Mendak in TNG's "Data's Day"). Other senior officer ranks, such as major, colonel and general, are army-style and may often be reserved for members of the Tal Shiar. Deanna Troi impersonated "Major Rakal" in TNG's "Face of the Enemy" and served as a kind of "political officer". A Founder impersonated "Colonel Lovok" in DS9's "The Die Is Cast" and commanded a fleet of Warbirds. The three Romulan generals mentioned in Star Trek canon may or may not have been Tal Shiar operatives. Velal, elevated from subcommander to general as of DS9's "When It Rains..." and "The Dogs of War", probably was not. Perhaps the unnamed Romulan general officer who rescued Tasha Yar and fathered Sela (TNG's "Redemption, Part II") was with the Tal Shiar: without official canon sources, these remain purely conjectural. General Movar (also frm TNG's "Redemption, Part II") likely was not in the Tal Shiar, as he took orders from Sela, and TNG's "Face of the Enemy" implied that no one of any rank in the Tal Shiar took orders from the military. The Tal Shiar is a Romulan intelligence organization. The name is an homage to the Tal Shaya, a Vulcan method of execution from the original Star Trek series where the neck is broken with a swift stroke for a quick and merciful death. Before the Dominion War, the Tal Shiar and the Cardassian Obsidian Order secretly worked together to launch a preemptive strike on the Founder homeworld. The plan was initiated by retired head of the Obsidian Order Enabran Tain, and was supported by Tal Shiar Colonel Lovok, who was later revealed to be a changeling, as a result the entire fleet was destroyed. Soon after, the Cardassian Union joined the Dominion while the Romulan Star Empire entered a pact of neutrality with them. In the Next Generation season 6 episode "Face of the Enemy", Counselor Deanna Troi was surgically altered by a Romulan underground organization to impersonate a Tal Shiar officer Major Rakal. In the Deep Space Nine season 6 episode "In the Pale Moonlight", Captain Sisko and Elim Garak successfully fool the Tal Shiar into concluding that the assassination of Romulan Senator Vreenak was carried out by the Dominion. Appears in "Unification" / "The Defector"
Romulus and Remus are the primary two Romulan planets. Both planets orbit the same central star (as depicted in Star Trek: Nemesis). Although they are not a binary planet system, Romulus and Remus are often referred to as "twin planets". Romulus had no sentient species until a revolutionary Vulcan movement colonized it around 400 AD. These revolutionaries, over time, became the Romulans. A sapient species called the Remans developed on Remus and was conquered by the Romulans, later becoming a lower class in Romulan society. The original colonization group of Romulans came to this system after they fled their homeworld in rebellion against the philosophy of peace and logic proposed by Surak. As Spock would later point out, if the Romulans retained the passions and expansionist outlook that the pre-Surak Vulcans once had, it would make them an extremely dangerous race. The Romulan government resembles the Roman Republic before it became the Roman Empire. The Romulan government consists of several parts: the Romulan Senate, the main governing and legislative body in a large chamber on Romulus. The Senate is headed by the Praetor, followed by the Proconsul. The Senate does not sit on the third day of the Romulan week. The Romulan Senate also has the Continuing Committee, which is composed of senators and high-ranking officials which all have to compete for a seat. Only the praetor is guaranteed a seat. In the Pocket Books novels by Diane Duane, the Romulan name for the planet is ch'Rihan, hence the endonym for the people is Rihannsu. The destruction of Romulus in the year 2387 is depicted in the 2009 Star Trek reboot; Spock Prime blames it on the explosion of a nearby star, said to happen 129 years after the events portrayed in the film (2258). As revealed in Star Trek: Nemesis, the inhabitants of Remus are the Remans, who were subjugated ever since the Romulans staked their claim to Remus and set up their new homeworld in the system. Because the planet is tidally locked to its sun, one side of the planet is in constant darkness. Living on this dark side has made the Remans extremely sensitive to light. The Remans were treated as second-class citizens within the Romulan Star Empire. Remus is the prime planet of dilithium mining and as such many Remans are forced into slave labor. Romulans are noted for their use of disruptor weapons, photon torpedoes, plasma torpedoes, and their signature cloaking technology, as well as having spaceships that are powered by artificial singularities (due to the nature of these engines, once activated, there is no way to shut them down: see black hole starship). In the 22nd century, they displayed advanced holotechnology and telepresence. A number of designs for Romulan starships have been presented. Since Star Trek: The Next Generation, Romulan warships have been referred to as Warbirds (D'deridex-class). The Romulans began as a revolutionary group of Vulcans who were referenced as "those who march beneath the Raptor's wings" and refused to accept the Vulcan philosopher Surak's teachings of complete suppression of emotions. Around 400 AD, the dissident group split off from Vulcan society and began the long journey to search for a new homeworld. At some point, whether before or after reaching Romulus is unclear, dissidents developed among the Romulans themselves, and a faction of Romulans established a civilization later known as the Debrune. The Romulan Star Empire was militaristic and bent on conquest. When Senator Valdore questioned this policy, he was dismissed from the Senate (although he later joined the military, and rose quickly through the ranks, becoming Admiral by 2154). In 2152, Humans made first contact with the Romulans when Enterprise (NX-01) encountered a Romulan-laid minefield. Communication was via audio only. The Romulans saw that Humans fostered a spirit of cooperation among the long-belligerent Vulcans, Andorians and Tellarites. Realizing that this would bring solidarity to the region and an obstacle to conquest, the Senate took steps to turn these species against each other. In 2154, Romulans covertly conspired with V'Las, head of the Vulcan High Command, to invade Andoria. V'Las's Romulan contact had the stated agenda of reunification with the Vulcans. A few months later, the Empire sent prototype holoships remote-controlled from Romulus to disrupt a peace conference between Andorians and Tellarites. The Romulans piloted the ships using an abducted Aenar; however, their scheme was thwarted by the combined efforts of the Humans, Vulcans, Andorians and Tellarites, led by Enterprise. This enraged the Romulans, who vowed revenge upon humanity. In 2156, the Earth-Romulan War began. Both sides used nuclear fusion bombs, which were some of the most advanced weapons technology available at the time, despite having been in Earth's weapons inventory since the 1950s. The war only ended after both sides had fought to the point of exhaustion, and realized that further conflict would result in mutual destruction. It has been implied that the Earth-Romulan War reached Earth, heavily damaging it: two centuries later, it was remarked that Earth had not been subjected to the horrors of total war since the date of the Romulan Wars. Though the war ended in a stalemate, it closed with the Battle of Cheron, which was a decisive Earth victory. It has also been noted that no visual communication took place between the Humans and Romulans at that time. V'Las remained perhaps the only citizen of the future Federation to be aware of the true origins of the Romulans. In 2160, the Romulans and the Humans signed a treaty ending the war and establishing a neutral zone one light year wide between their territories. The treaty was negotiated via subspace radio, again with no visual contact. In 2161, Humans, along with Vulcans and several other species, founded the United Federation of Planets, which continued this wary peace. Using a cloaked ship, the Romulans broke the treaty of 2160 by attacking several Federation outposts, circa stardate 1709.21, in the year 2266 ("Balance of Terror"). In response, the USS Enterprise (NCC-1701) tracked down the cloaked Romulan ship and destroyed it. This was also the first time humans saw what the Romulans looked like physically, and Spock surmised a common ancestry. Around 2267, it is thought that the Romulans entered a treaty with the Klingon Empire: in exchange for cloaking technology, the Romulans received D7-class battle cruisers, which were upgraded into extremely deadly war machines. This was, or was theorized to be at the time, the first Romulan experience with warp drive and speeds faster than light. (The script of "The Enterprise Incident" originally called for a Romulan ship to appear, but the original model was not available: rather than go to the expense of building a new one, the Klingon D7 model was substituted.) Spock mentioned intelligence about this treaty when the Klingon ship appeared on the viewscreen, at the outset of "The Enterprise Incident". The Romulan commander further implies the common ancestry when she confronts Kirk about violation of Romulan space. The events of 2154 suggest the Vulcans withheld from humans their prior knowledge of Romulan kinship with Vulcans. Circa 2272, Klingon forces led by Kor had a victory over some Romulan opponents in the Battle of Klach D'Kel Brakt. In 2293, the Romulan ambassador to the Federation, Nanclus, took part in a conspiracy to sabotage peace talks between the Klingons and the Federation. The attempt was unsuccessful, and Nanclus was arrested on Khitomer, along with several other conspirators. During the Khitomer conference, the Romulans signed a treaty with the Federation and the Klingons. Notably, Ambassador Sarek of Vulcan sat with his Romulan cousins during the conference, indicating a dialogue, or at least a display of goodwill between the two peoples. In 2311, an event known as the Tomed Incident occurred between the Romulans and the Federation, costing thousands of lives. The details of the Tomed Incident are never revealed canonically, but it is referred to by Enterprise-D crew members in the Next Generation episode "The Neutral Zone" as "disastrous"; it resulted in the signing of the Treaty of Algeron, which reaffirmed the Neutral Zone as a no-fly zone and prohibited the Federation from developing cloaking technology. For the next fifty years, the Neutral Zone was quiet. There was no direct contact between the Federation and the Empire, nor were there any further Romulan incursions. In 2344, four Romulan Warbirds attacked the Klingon outpost at Narendra III. The USS Enterprise (NCC-1701-C) responded to the outpost's distress call and engaged the Romulan ships, but was defeated and taken with its survivors (among them a version of Lieutenant Tasha Yar from the future of an alternate timeline) back to Romulan territory. Rumors circulated in the Federation that the Enterprises's broken hull was displayed on Romulus, to boost the morale of Romulan fleet academy students. The Klingons considered this action dishonorable, in contrast to the honor they saw in the Starfleet ship's attempt to defend Narendra III, despite being vastly outnumbered. As a result, relations strengthened between the Klingon Empire and the Federation. Then in 2346, the Romulans covertly assisted by a Klingon traitor, Ja'rod, attacked another Klingon planet, Khitomer and killed or captured all but two of the planet's population. In 2351, a Romulan science vessel on a deep space mission under the command of scientist Telek R'Mor encountered an unstable temporal micro-wormhole and made contact with the Federation starship USS Voyager, stranded in the Delta Quadrant in 2371. The crew of Voyager desired for R'Mor to tell the Federation of their fate, but Voyager was 20 years into the future. As a result, R'Mor agreed to hold onto their messages for another 20 years before delivering them in order to preserve history. However, he died in 2367 before he could do so. Circa stardate 41986.0 (December 26, 2364), the Romulan Star Empire ended its five decades of isolation when the USS Enterprise (NCC-1701-D) intercepted a Romulan Warbird. Several Romulan outposts had been destroyed by a then unknown force (later implied to be the Borg). The Romulans opened communications to see if they could glean the information from the Federation, who had suffered similar losses. The Romulan Commander Tebok explained that the Romulans had decided to concentrate on their own internal affairs for the past fifty years and said "We are back", indicating that Romulans would again be active in galactic affairs. In the Star Trek: Deep Space Nine episode "Past Tense, Part One", after Earth's history was inadvertently altered so that the Federation was never formed, the Romulans had established a presence in the Alpha Centauri system by the 24th century. Since Alpha Centauri is the star system closest to Earth, it indicates that, in the altered timeline, the Romulans invaded Earth's stellar region, despite not even being prompted by Earth's role in the encouragement of interplanetary cooperation. In 2366, the Romulans attempted to trick the Enterprise-D into crossing the Neutral Zone, where two Romulan Warbirds were waiting to capture or—if necessary—destroy it. However, Captain Jean-Luc Picard, foreseeing a possible trap, had quietly contacted the Klingons beforehand: as a result, the Enterprise was covertly accompanied into the Neutral Zone by three Klingon Birds-of-Prey. Now evenly matched, the Romulans decided that the price of the Enterprise's destruction was too high and retreated ("The Defector"). Towards the end of 2373, the Romulan Empire signed a non-aggression treaty with the Dominion, which had gained a foothold in the Alpha Quadrant in Cardassian space shortly before the Dominion War broke out. The rogue Federation agency, Section 31, had an agent in the Tal Shiar to safeguard Federation interests feeling that after the Dominion War, the Federation and the Romulan Star Empire would be the only two powers left in the region and would go to war. Circa stardate 56844.9 (November 4, 2379), the Romulan Senate was briefly overthrown in a Reman uprising led by Shinzon. After the senior Romulan leadership was assassinated in the Romulan Senate, the Remans took over the Senate and Shinzon became Praetor; However, he was dispatched by Captain Jean-Luc Picard shortly afterwards, with the Romulans regaining control of their government in the aftermath. Relations between the Romulan Star Empire and the United Federation of Planets improved somewhat as a result of Picard's assistance (Star Trek: Nemesis). There is no canonical information concerning the actual size of the Romulan Empire in comparison to the Federation. Star Trek writer/producer Ronald D. Moore has indicated that it is larger than the Klingon Empire but smaller than the Federation. However, in the Voyager computer game, Elite Force, the Romulan Star Empire is about two-thirds larger than the Klingon Empire, and is well over five times as large as the Federation, considering the Romulans' expansionist nature. In the Star Trek Atlas, the Romulan Star Empire is about 1/3 the size of the Klingon Empire and surrounded by the Federation. Their territory has a spherical shape with a small tail shape extension heading to the Delta Quadrant. In the book The Romulan Way by Diane Duane and Peter Morewood set in the 23rd century, it is implied that the Federation's resources far outstrip the Romulans, and in any conflict, the Federation would prevail by sheer weight of numbers. Several other episodes and licensed materials such as the Next Generation episode "Face of the Enemy" and the video game Star Trek: Starfleet Command III support this, and give the indication that the force multipliers of cloaking technology and other such secrecy is the only way they can maintain an even footing with the numerically superior Federation. Diane Duane's miniseries Star Trek: Rihannsu, consisting to-date of five books written between 1984 and 2006, is regarded as one of deepest works focusing on the Romulans. In Dalla Van Hise's Killing Time (1985), the Romulans use time travel to alter history, which results in James T. Kirk becoming an ensign and Spock a starship captain. A prototype Romulan warbird is the focus of Simon Hawke's novel The Romulan Prize (1993). Robert Greenberger's The Romulan Stratagem (1995) involves Jean-Luc Picard and his crew competing with the Romulan officer Sela to convince a planet to join their respective states. In Diane Carey's Red Sector (1999), Spock and Leonard McCoy try to cure a virus that has infected the Romulan royal family. Josepha Sherman and Susan M. Schwartz's Vulcan's Heart (1999) involved Spock traveling to Romulus to aid the Romulan Commander from "The Enterprise Incident". Captain's Blood (2003), one of many collaborative works between Star Trek lead William Shatner and husband-and-wife team Judith and Garfield Reeves-Stevens, focused on the involvement of Kirk in preventing a Romulan civil war in the aftermath of Star Trek: Nemesis. The Tomed Incident is the focus of David R. George III's novel Serpents Among the Ruins (2003), which featured the crew of the Enterprise-B. Star Trek: Vulcan's Soul is a trilogy written by Sherman and Shwartz between 2004 and 2007; set in the aftermath of the Dominion War, it focuses on members of Kirk's original crew becoming involved in a war between the Romulans and a fellow Vulcan offshoot, the Watraii. In Star Trek: Titan premier Taking Wing (2005), the Romulan Star Empire collapses into civil war in the wake of Star Trek: Nemesis. The Star Trek: Titan novel The Red King (2005) opens with the disappearance of a Romulan fleet and features Donatra, the Romulan commander featured in Star Trek: Nemesis, working alongside William Riker and his crew. In the novel Kobayashi Maru (2008) by Michael A. Martin and Andy Mangels, Admiral Valdore attempts once again to cause conflict in the region approximately one year after the incident involving the Aenar, this time using a "telecapture" system, designed to take over and control enemy ships. Using three Klingon vessels, Valdore attacks Coalition of Planets allies hoping to weaken or destroy two enemies of the Romulan Star Empire by provoking a war. Captain Archer is eventually able to provide evidence of this Romulan deception. This is followed by yet another unsuccessful attempt to break apart the alliance which involves using telecaptured Vulcan cruisers against Proxima Centauri (a recent coalition member). In the book, the event that finally sparks the Coalition's declaration of war against the Romulans is the destruction of the Earth freighter Kobayashi Maru. The sequel to the novel Kobayashi Maru is titled The Romulan War: Beneath the Raptor's Wing by Michael A. Martin. It is set between July 22, 2155 and July 22, 2156, and details the war between the Coalition of planets and the Romulan Star Empire. The story focuses on the Romulan attempts at taking over the Coalition whilst the Vulcans who are aware they are vulnerable to the telecapture weapon withdraw from the fight early. The other Coalition members withdraw one by one in the face of continued losses, leaving it up to Earth Starfleet to stop the Romulan menace. The Romulans did not appear on screen in the Mirror Universe. The only canonical mention was in the 1995 Star Trek: Deep Space Nine episode "Through the Looking Glass". Impersonating his Mirror Universe counterpart, Benjamin Sisko claims that he is going to negotiate with the Romulans to secure their aid for the Terran Rebellion, suggesting that the Romulans are a significant power. However, this is merely a cover-story to explain his departure from the mirror Deep Space Nine, after which he would return to his own universe. According to the 2009 Star Trek remake and the prequel comic series Star Trek: Countdown, Romulus is destroyed in 2387 by the Hobus star going supernova. Spock was dispatched to stop the supernova with a red matter device but arrived too late. However, the implosion of the supernova caused by the red matter opened a rift in space-time that sent Spock and the Romulan mining ship Narada, along with its captain, Nero, and its crew, to go back in time more than 100 years, creating an alternate timeline. Driven mad with grief, mostly because of the death of his pregnant wife, Nero and his men seek revenge against the Federation, whom they view as having caused the catastrophe indirectly, including the older version of Spock using the superior technology of their ship and equipment. Nero also destroys the Federation starship USS Kelvin, seven other Federation starships, as well as a fleet of Klingon ships, and the planet Vulcan in the film's timeline. The problems of the Hobus supernova being so devastating to other star systems is addressed in the computer game Star Trek Online, by declaring the blast to have "traveled through subspace". This information below originates from the board wargame Star Fleet Battles, as well as related game systems such as Prime Directive and Federation and Empire. The Romulans eventually signed the "Treaty of Smarba" with the Klingon Empire, which supplied the Romulans with advanced Warp drive and a number of mothballed Klingon vessels in exchange for drawing Federation forces away from the Klingon border. These Klingon-built starships were fitted out with Romulan weaponry and cloaking devices (as seen in "The Enterprise Incident"). This technology allowed the Romulans to develop a new series of vessels which caused significant headaches to their enemies. The Romulans in the Star Fleet Universe held a long-standing enmity with the Gorn Confederation, but their old "Eagle" series warships were no match against the advanced Gorn warships. The Klingon Empire even launched devastating raids against Romulan frontier bases and squadrons, and was planning a full-scale invasion were it not for the misfortune of the Tholians' arrival. The Tholians drove a wedge between the Klingons and Romulans, arriving in the region of Klingon space where the invasion was being prepared. The Klingons kept these events a secret from the Romulans for a long time. The Romulans eventually emerged in the post-Smarba period with a powerful new fleet composed of "Kestral" (Klingon-built vessels) and "Hawk" (hybrid) series fleets, along with extensively retrofitted "Eagle" vessels. After the Klingon Empire persuaded the Romulans to enter the General War, the Romulans invaded the already besieged Federation on what they called "The Day of the Eagle". Despite significant strategic advances into Federation space, they were eventually driven back to their own borders, and suffered a devastating wartime catastrophe on Remus. After the General War, the Romulan Empire erupted in civil war, had their border stations destroyed by the Interstellar Concordium in the course of the ISC War of Pacification, and subsequently aided in resisting the extragalactic Andromedan invasion. A bruised Romulan Republic emerged from the ruins of their once proud star empire. Many of the terms used in relation to the Romulans are derived from Roman mythology and government. Romulus and Remus are the two brothers who founded the city of Rome. The proconsul and praetor were government officials during the Roman Republic and the Roman Senate was its governing body. In TOS episode "Who Mourns for Adonais? ", it is revealed that the classical Greek and Roman gods were actually a race of advanced beings who had visited Earth thousands of years ago. It has been postulated that the same beings had visited other worlds as well – such as Vulcan, or Romulus. The theory did at one time appear on the Star Trek website, and would explain the connection between the Romulans and Roman mythology, as well as the institutions of Roman government. ^ Star Trek: Deep Space 9: "By Inferno's Light"
^ Star Trek: Deep Space 9: "Call To Arms"
^ a b "Gambit (Part I)". Star Trek: The Next Generation. ^ "The Pegasus". Star Trek: The Next Generation. StarTrek.com - "Strange Relations: Romulans and Vulcans"
StarTrek.com - "Great Romulan Episodes"